Codex Celtarum:The Codex Celtarum contains a veritable host of gaming material. Built around the complete mythological cosmos of the Celts. Codex Nordica: From Odin's Ravens to the Jotun fortress of Gymirsheim. Brian Young explores the Nine Worlds of the northmen, the legends and myths, the magical creatures, gods, heroes, giants and monsters that peopled them. With new spells, monsters and classes. Codex Germania: The Codex Germania unearths the mythological realms of the ancient Germans. From the murky forests of their beginnings rise the myths, the magic, gods, goddesses, monsters, heroes and legends of the ancient Germans. Codex Slavorum: The Codex Slavorum opens roads into the mythological realms of the ancient Slavs. Born in the shadow of Siberia their myths and magic, their gods, goddesses, monsters, heroes and legends offer an untouched wealth of material for your Castles & Crusades game. Codex Classicum: The Codex Classicum plunges into the mythological realms of the ancient Greeks and Romans. The myths to the magic, the gods, goddesses, monsters, heroes and legends of the ancient classical civilizations. All this is presented as a backdrop to the game you are already playing. 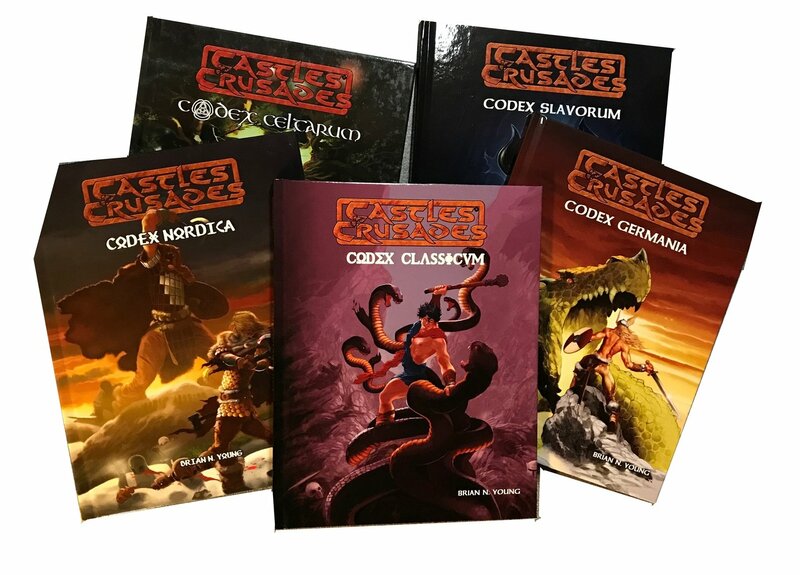 Expanding upon the core Castles & Crusades material Mythos brings you a host of new wizardry and enchantments, gods for the characters, warriors and battle craft. Added on to all this, are new materials for the Castle Keeper, all designed to enhance rather than hinder play.